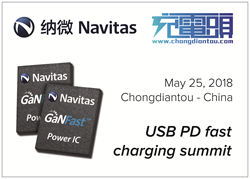 Navitas Semiconductor announced today that the company will showcase its leading GaNFast™ power ICs and the world’s smallest and fastest-charging USB-PD chargers at the China USB PD Fast-Charging Summit (May 25th, 2018). “I am honored to be invited to speak at the China USB-PD fast-charging summit”, said Navitas co-founder and CTO/COO Dan Kinzer. “GaNFast technology enables designers to increase frequency 10x-20x, increase efficiency, reduce size, and reduce system cost. Together we are creating affordable fast-chargers much smaller than the palm of your hand, slide easily into your pocket, and won’t weigh you down. Exhibition: Open from 10:00am to 6:00pm. Navitas Semiconductor Inc. is the world’s first and only GaN Power IC company, founded in 2014 and based in El Segundo, CA, USA. Navitas has a strong and growing team of power semiconductor industry experts with a combined 200 years of experience in materials, devices, applications, systems and marketing, plus a proven record of innovation with over 200 patents among its founders. A proprietary process design kit monolithically integrates the highest performance GaN FETs with GaN logic and GaN analog circuits. Navitas GaNFast power ICs enable smaller, higher energy efficient and lower cost power for mobile, consumer, enterprise and new energy markets - over 35 Navitas patents are granted or pending. Chongdiantou (CDT) is the earliest Chinese professional institution to perform evaluation and tear-down analysis for battery-charging technology of digital devices and peripheral accessories, including mobile charger, powerbank, battery, USB power socket, charging wire, etc. Navitas Semiconductor, the Navitas logo and GaNFast are trademarks or registered trademarks of Navitas Semiconductor, Inc. All other brands, product names and marks are or may be trademarks or registered trademarks used to identify products or services of their respective owners.